This is one fabulous sewing machine! 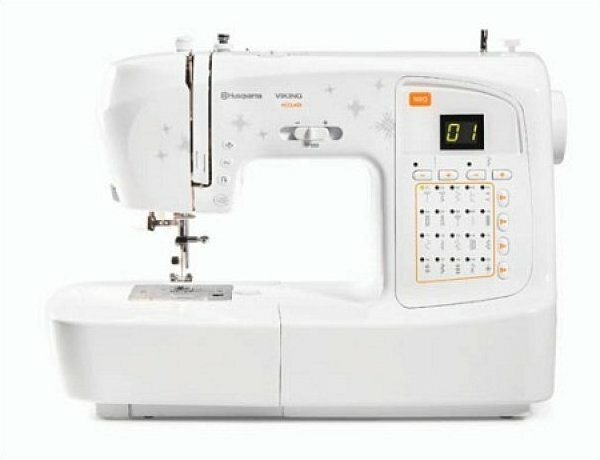 •Computerized sewing machine with functions that save time and make sewing easy. •20 built-in stitches including quilting, utility and decorative stitches; plus, two one-step buttonholes, that are ideal for creative projects. Adjust stitch width up to 7mm. •Adjustable presser foot pressure will let you sew any fabric type and weight with perfect results. •Compact and lightweight at just 15 lbs (7kg) – perfect for travel and classes. •Start/Stop button lets you sew without the foot control. •Speed Control Slide makes it easy to adjust the speed for greater control. •Needle Stop Up/Down sets the needle to stop up or down for pivoting, appliqué and accurate sewing. •Extra-High Presser Foot Lift raises the presser foot to its highest position so that thick fabrics and multiple layers can be placed effortlessly under the presser foot. •Built-in Needle Threader makes threading easy.